For many people, public relations remains a bit of a mystery. If pushed for an answer, most will say something about press releases and crisis management. While PR does involve both of these things, this barely touches the sides! Do you want to increase your company’s credibility, grow awareness, and build its reputation? These are the vital foundations that all businesses are based on, and this is what an effective public relations strategy delivers. So first off, before we start explaining how to do PR, what exactly is public relations? This question stumps a lot of people and often takes up whole chapters of overly technical explanations in PR for Beginners books. So let’s unpack this a little. Public relations is the art of building all the positive attributes of a company into a narrative that supports the company’s goals. The media is then used to broadcast that narrative to their audiences. In PR talk, getting your business mentioned in the media, such as in an article, is termed as winning earned media. The point in winning earned media is to create the factors required to help a company achieve its goals. A goal could be to increase sales or win new clients. A PR strategy can deliver this both directly and indirectly. Winning earned media can directly drive more traffic to a website, such as via click throughs on backlinks. While more importantly, building credibility and increasing awareness through earned media will indirectly drive more business and improve conversion. As the above shows, the media is the conduit through which a company delivers their public relations strategy. Therefore, building relationships with journalists, bloggers and other media influencers is vital. How you build relationships, earn media and deliver a public relations strategy is explained in this guide to public relations. Public Relations is as a means to an end, rather than an end in itself. Winning earned media and getting a company name in print is sometimes viewed as the sole objective of PR. But this is just the means through which the broader aims of a PR strategy can be delivered. So what are these aims? Credibility – essential for any business, especially a startup, if it wants to win new clients, increase sales or attract talent. PR helps to deliver this by getting your narrative in front of your target audience and building a digital footprint. Awareness – once your startup or business is seen as credible, you need awareness to continue to grow. With PR, you can showcase your product and your business through media wins such as professional reviews and guest appearances. Social proof – this shows to potential investors, customers or employees why you and your company should be taken seriously. Social proof may be the fact you’re an industry expert or that your startup was part of a prestigious accelerator program. Earned media is used to communicate this message to your audience. Improved search rankings – PR and SEO work hand-in-hand these days. When a business wins a piece of earned media in an online publication, this usually includes a backlink to their website. And backlinks still remain a vital ranking factor, even in 2019. As discussed above, PR’s primary objective is to help create the underlying factors required for a company to succeed. On the other hand, marketing’s primary objective is to increase revenue by directly driving more business to a company. The methods of public relations and marketing are very similar, as both rely on the media to get their message out to their target audience. The key difference here is that with PR activity, you win earned media in editorially produced content at no direct cost. For example, TechCrunch writes a review about your product. But with marketing, you directly pay for advertisements in media channels, which is termed as paid media. For example, newspaper ads, sponsored Tweets and Google Ads. The answer is that a good PR strategy supports a company’s marketing efforts. Consumers need to have sufficient trust in a brand, before they’re willing to part with their cash. And earned media is the most effective way of building this trust. In which case, spending money on marketing before this trust has been built will limit a business’s ROI. The PR landscape in 2019 looks very different compared to just a few years ago. As such, many PR guides are already out of date. Traditional media such as newspapers and magazines have continued their trend of ever-shrinking circulation numbers. Meanwhile, the troubles faced by this industry stand in stark contrast to online media outlets and influencers, who now possess more power than ever. Add to this mix the one hundred million startups that recent estimates calculate are founded each year, all fighting to be heard. 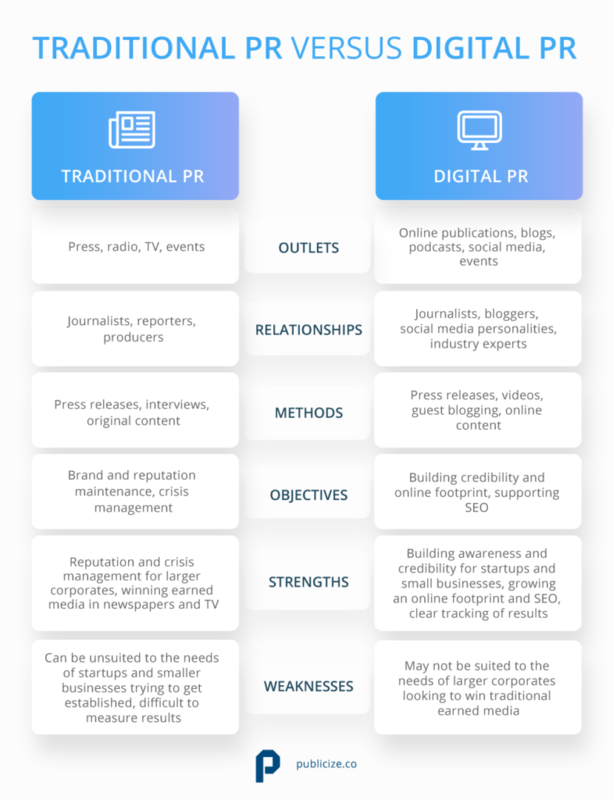 While traditional PR is still important to many companies, digital PR has arguably supplanted traditional PR in importance for many others. For example, many startups leverage the techniques of digital PR to efficiently build their digital footprint. Whereas traditional PR activities like crisis management and brand maintenance are less important services. Digital PR also provides secondary benefits, including natural link building via backlinks in earned media, which provides a direct SEO benefit. Quality referral traffic is also generated via click-throughs. And of course, as with anything digital, progress such as online mentions, social shares, site visits and organic positions can be tracked and measured, on a click by click basis. You can view Inbound PR as an extension of digital PR. It combines the content creation and media outreach of public relations, with the metrics and measurement of inbound marketing. This approach to PR allows businesses to better quantify their ROI and optimize their strategy more effectively as they go. For example, if you’re not getting the share of voice you set out to achieve, you can analyze weak spots with your data and tweak your strategy. Here’s an infographic explaining the inbound PR process in more detail. Another great resource for inbound PR is Iliyana Stareva, one of the leader thinkers in this area. So as the above explains, the main point of PR is to help companies and brands build factors such as trust, legitimacy and reputation. These are the foundations that all companies need, in order to grow and achieve their goals. And you build these factors by getting your narrative into earned media. What is earned media exactly? When we refer to earned media for PR, we mean any channel or medium of influence, that has some form of editorial control. You win earned media by offering something that’s considered to be editorially relevant to that media’s target audience. Some common examples of earned media include getting mentioned in a newspaper article or receiving a professional review. It’s also important to place earned media in context. A combined PR, marketing and coms strategy has four broadly defined media channels that can be leveraged. Earned media is one of these. Paid media is the domain of marketing, so doesn’t form part of a public relations strategy. But shared and owned media both play an important role in supporting a do it yourself PR strategy. Content produced on owned media, as part of a content strategy, can be picked up by media outlets and become an earned media win. At the same time, owned media content also plays an important part in supporting the narrative you’re trying to build through earned media. Shared media, meanwhile, can be used to amplify any earned media wins, such as retweeting and sharing any links to earned media. Shared media is also an important tool for building relationships with media influencers, the gatekeepers to earned media. So all three of these channels need to work in tandem if you want to get good PR. Many people believe this to mean only social media influencers, or influencer marketing (which is not PR at all). When it comes to public relations, this simply means anyone who’s an opinion former or trendsetter, or who can amplify your message to an audience. To be an opinion former or trendsetter, you need a following and a platform, as well as respectability and authoritativeness. This was a pretty self contained list in the pre-digital media era, such as journalists, columnists, industry experts, and tv and radio producers. But in today’s fragmented media landscape, there are many different types of influencers. Influencers are the gatekeepers to earned media. To snag an interview on a top business podcast, get a marketing guru to mention your company, or have your product featured in TechCrunch all relies on winning over influencers. Firstly you need to identify influencers relevant to you, your industry and your brand, then work hard over the longterm to build relationships with them. Who are the influencers operating within this media that are the most relevant to your brand and your message? In the old days, large companies could pretty much just send out a press release as and when they had something to announce. Journalists would then willingly write these up into articles, and hey presto, they would win earned media. I’m afraid to say this approach to PR no longer cuts the mustard in 2019. While press releases do still play an important role in a well balanced PR strategy, companies need to be far more imaginative. After all, the average startup only has a limited number of genuinely newsworthy announcements to turn into press releases each year. How then do you win media coverage on a regular basis when you don’t have any big company announcements up your sleeve? You need to develop a PR plan where you’re regularly approaching journalists and other media influencers with interesting ideas and pitches. These need to help further your narrative, tie in with your product and have wider relevance to your industry or something topical in the newscycle. Effective media monitoring can really help to inform your pitches. The below infographic explains the thought process a little more clearly. 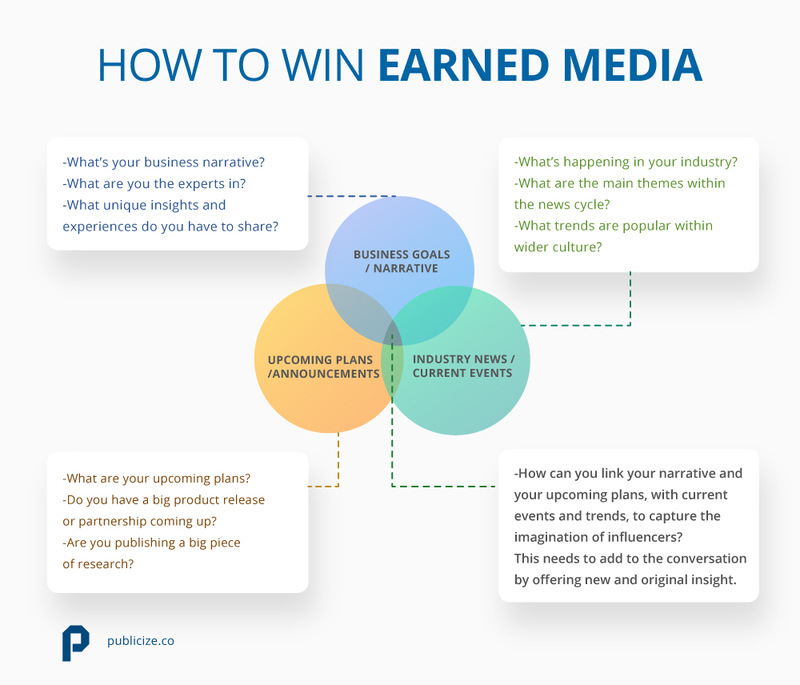 Once you’ve come up with a killer idea to win earned media, you then need to pitch it. Who your target audience is will dictate which journalists, reporters and other media influencers you pitch to. Read our post on how to find journalists’ contact details and the best tools to use to do this. Press releases – a quick and efficient way of sending information to journalists and reporters. Learn when and how to write a press release. Guest articles – penning your own guest article and sending this to publications is a great way to win earn media “in your own words”. Follow these tips on how to write a guest article. Product reviews – to get your product professionally reviewed, such as on CNET, will usually require pitching it to your target media outlets. Guest appearances – landing guest appearances, such as on industry podcasts or at speaking engagements, are another great way of winning earned media “in your words”. Expert commentary – providing journalists or reporters with your expert opinion on a topical news event is brilliant way to start building long term relationships. 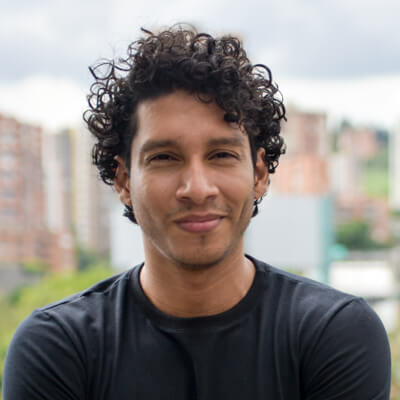 With over 45% of the population lacking a bank account in Latin America and VC firms showing a willingness to back new entrants to the market, the opportunities for tech and startup firms to compete in what is basically virgin territory seems very promising. The trends have already begun with fintech investment tripling in growth from 2015 to 2016 and more than doubling in growth from 2016 to 2017. The new cultural shift in the startup landscape that will allow startups to help small businesses across the region. [YOUR NAME] would be more than happy to provide expert commentary for any future stories on this subject. She is also available for interviews, or could even pen an article on this topic which could provide your readership with great insight and actionable takeaways. The impact of PR, just like any other business function, needs to be measured and tracked. A common misconception is that the effects of PR are intangible and can’t be quantified. It’s true that in the pre-digital era measuring the impact of PR could be difficult. But in the digital age, that’s all changed. And while you can’t necessarily put a number on credibility, there are many other things you definitely can and should measure. These are measurements of your earned media wins. As winning earned media is a means to an end, rather than an end in itself, these measure the outputs of this. This enables you to see if you’re on the right track with your media wins. Key performance indicators (KPIs) measure the impact of your PR activity against your PR goals. As your PR goals are dependent on your business goals, KPIs can vary from company-to-company. Regular media monitoring is essential in order to gather the data for this. 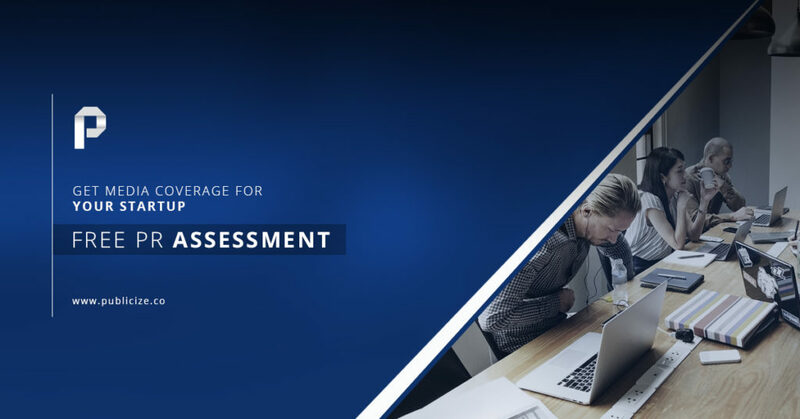 Read our post on the best tools to use for media monitoring in 2019. So these are the broad strokes of how to do PR. You know now what PR is and what it’s used for, how earned media is the channel through which a PR strategy is delivered, and how to pitch to the media, win media coverage and measure results. And a final point to end on, which is also a very important one. PR, like most business functions, is something that requires continual effort. Sending out a press release as and when you have something to announce is no longer an effective strategy in 2019. You need to build relationships with the media and continually offer them interesting and original content. Over time, as your media wins start to increase and your brand becomes more established, you’ll start reaping the rewards that this brings. 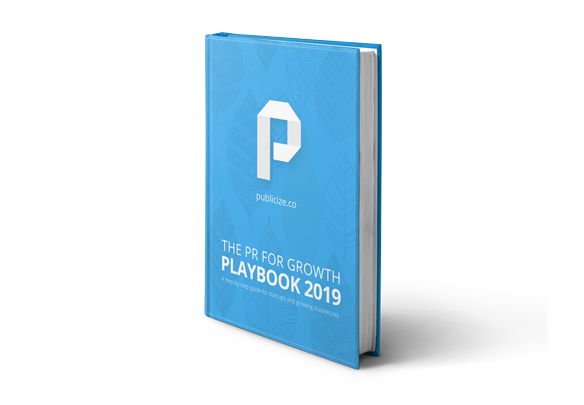 Now you’ve read our guide to PR, download our PR for Growth Playbook 2019. This is a PR for beginners playbook, providing a step-by-step guide on how to do public relations.